For a number of reasons the number of new users who post low quality questions or answers does not appear to be flagging by any measure. This issue had often generated stress among users who rightly insist on a more correct usage of the site and expect new users to be compliant with the site rules. I wonder if, rather than keeping on suggesting to take a tour for the site rules, we offered a short 5 to 10 minutes teach-in video in which the main features and rules of ELU can be easily visualised and , probably, more easily understood. The video could concentrate on apparently unsolvable issues like; lack of research, proofreading and general reference for instance, which could be shown with examples from past questions and the subsequent hold or deletion of the off-topic posts could probably be more easily explained. The short video could be made compulsory for new users to whom access to the site would not be allowed till the whole video has run out. It does not intend to replace the written rules, but just to make them easier to assimilate. I think that watching and listening to instructions is more effective then just reading them. Edit: what do the many donwvotes mean? An aversion to change or a poor and ineffective suggestion? I upvoted the question because (1) I appreciate your continuing effort to improve the quality of questions and answers around here, and (2) I think a short video presentation might work with drive-by questioners who aren't especially keen on researching the site's standards—especially if it means reading something. But I second Dan Bron’s suggestion that the video be about how not to ask a question. You could title it "VIDEO: How can I ensure that other people will downvote and close the questions I ask on EL&U?" or "VIDEO: Why do the people here hate my question?" Then present examples of five or ten types of questions that drive EL&U regulars nuts, and respond succinctly to each one. Clueless question: Someone called something I said "hyperbole." What does that mean? Response: Let me look that up for you in a dictionary. Or on second thought, why don't you look it up in a dictionary? Clueless question: Please correct this sentence: "Happy with the strong performance in the test, it was decided that Ram give himself a five day rest." Response: EL&U isn't a proofreading service. No one but you cares or will ever care about the particular sentence you just brought up. So it makes no sense for us to clog our archives with one-off questions like this one. Clueless question: Is it "What are you inferring?" or "What are you implying?" I hear both words being used to mean the same thing. Response: You see that white box—the one with the magnifying glass and the words "Search Q&A" in faint gray letters—near the top of the page on the far right-hand side? Type infer imply into it and click Enter (or Return), and you'll find that someone else has asked a very similar question about the difference between the two words. Conveniently, the answers are already there for you to consult and consider. 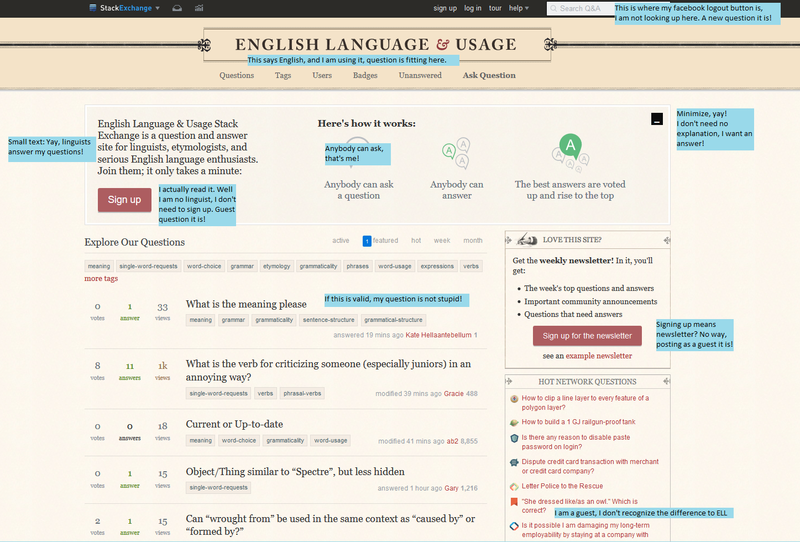 English Language & Usage search: Use it before you ask. Clueless question: What is a single word that means "marauding sea elf"? Response: Have you ever stopped to consider that "marauding sea elf" might be a better choice than, say, "aggroaquasprite"? Sometimes there isn't a single word for some complicated phrase or multifaceted idea—and there shouldn’t be. Clueless question: In English the word is "I have going" or "I was went"? 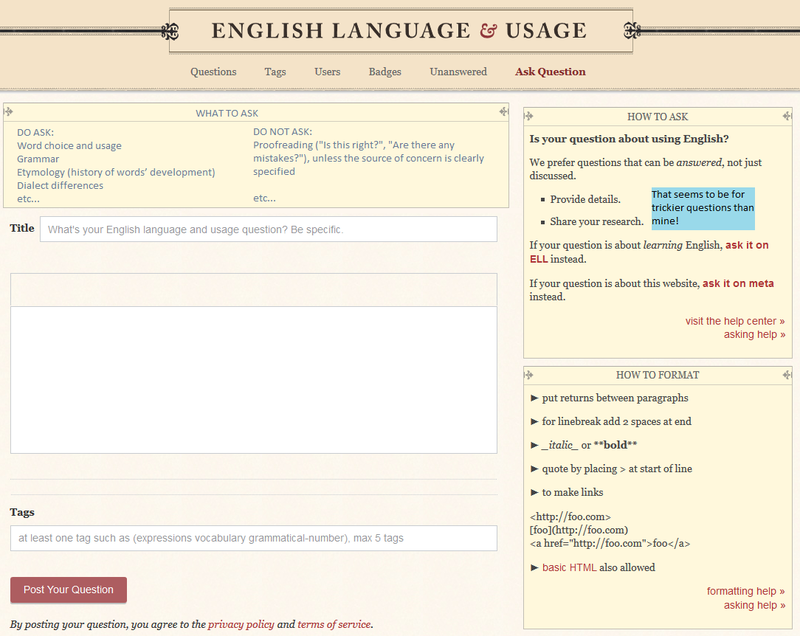 Response: If you are new to English and have basic questions about how to speak it, you might find a more welcoming environment at English Language Learners, a site created to help beginning and intermediate students of the language improve their grasp of it. Clueless question: My company is about to release a new product, and we need a slogan that tells buyers this is the best thing on the market, a must-have item, and well worth the price. Suggestions? 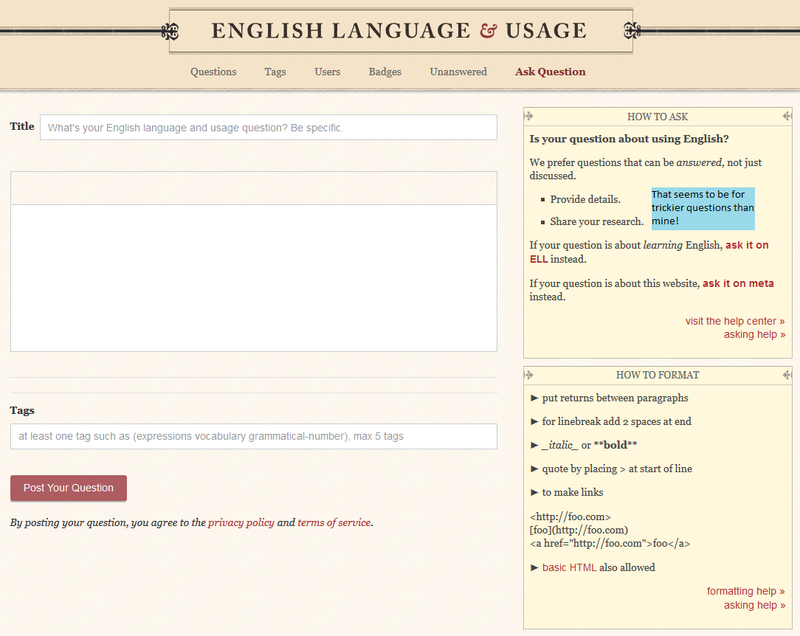 Response: Your question isn't about English language and usage; it's about marketing. This site is not a free crowd-sourcing mechanism for composing commercial slogans. Clueless question: What does Blake mean by "symmetry"? Response: That's a tough question to answer—and not just because you've provided almost zero context for it. If you're asking about William Blake’s use of "fearful symmetry" in his "Tyger" poem, you're asking for literary interpretation—and we don't do that here, largely because it falls into the realm of opinion rather than fact. Clueless question: I am so sick of seeing people use propinquity when they mean propensity. Making such a dumb, easily avoidable mistake simply defies reason. And don't tell me that if enough people say propinquity when they mean propensity, that will make it okay and we'll all just sit around in close propinquity (or is it propensity?) singing kumbaya. Am I right? Response: You're ranting. Don't come to EL&U and rant. This script may look harsh, but I suspect that it would sound less so in a video. In any case it covers some of the more common categories of bad or misdirected questions we get at EL&U, and newcomers might be tempted to watch just because (1) it's a video, and (2) the title is intriguing. In my opinion a video wouldn't help. I think the real problem is there is no indication on the way to posting a low quality question that indicates exactly that fact to a new user. I agree with P. Obertelli, no one reads tours watches intro videos. The neglible amount of people who do don't post bad questions afterwards. To put it bluntly, the starting page asks for those kind of questions and nothing is stopping anyone on the way to ask the question. Let's have a quick look at how the site looks to those users. There is nothing on the start page that indicates that research is a prerequisite for a question, proofreading is off-topic or anything the like. This is how it looks like on a first visit. The ask question dialog, still not logged in, is no further help either. It doesn't hint at any research either. There is a "how to ask" (yeah my question is not complicated enough for details or research) and a "how to format" (woohoo, big letters for my important question) section. What is missing? A "what to ask" section. 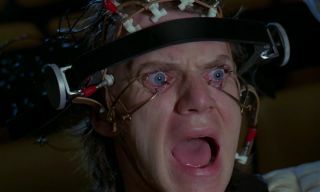 I'm opposed to it being a compulsory video. Some people may lack the bandwidth or technology to play a video, or may have difficulties being verified as watching the video. Also, some users may have disabilities meaning they can't watch or hear a video, or may wish to translate some parts of the content into their native language using machine translation. Instead, provide them with a web page that contains in textual information all the information they need, with pictures or video as an optional resource. There'S a far simpler way to weed out low quality Q&A by indicating clearly what this site is about: chose the right title. Most people ( I don't remember the exact figures but we're talking 95% + for anything concerning stuff online) –including me– don't read disclaimers, guidelines, tours or users' agreements etc. normal people just jump in and expect to learn as they use a site or app. You could make a video, actually, you should make it, why not?– but I guarantee that you'll be talking in tens of views not even hundreds. English Language and Usage is too broad and does not indicate well enough what level is this site about, particularly for English learners. Something like "Advanced English Language and Usage, "English language and Usage, advanced", "Expert; English Language and usage" etc. or even a subtitle (if ELU wants to keep its title intact) that indicates this notion clearly would go a long way and be the best return on value. A quick video guide is ten times better than reading through dozens of instructions, for me, at least. But I propose such a video should be optional, not mandatory. It would be good to have a link to this video in ELU's preset comments. Can we reverse the trend on low quality questions? Why must we assume that earlier answers are better, especially when they are not even related?